Gnomes. Elves. Dwarves. 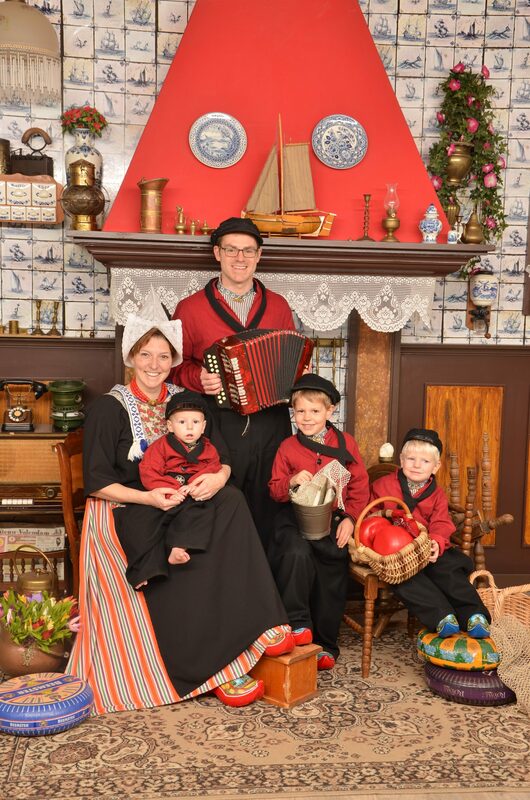 Kabouters. Whatever you call them, these adorable little creatures have taken over the Polish city of Wroclaw. My Littles spent the majority of their time in Wroclaw hunting down the Wroclaw Gnomes. Gnome hunting turned out to be a great way to get the kids to walk around the city without complaint. As a result, Wroclaw topped our kids’ list of favorite Polish cities. 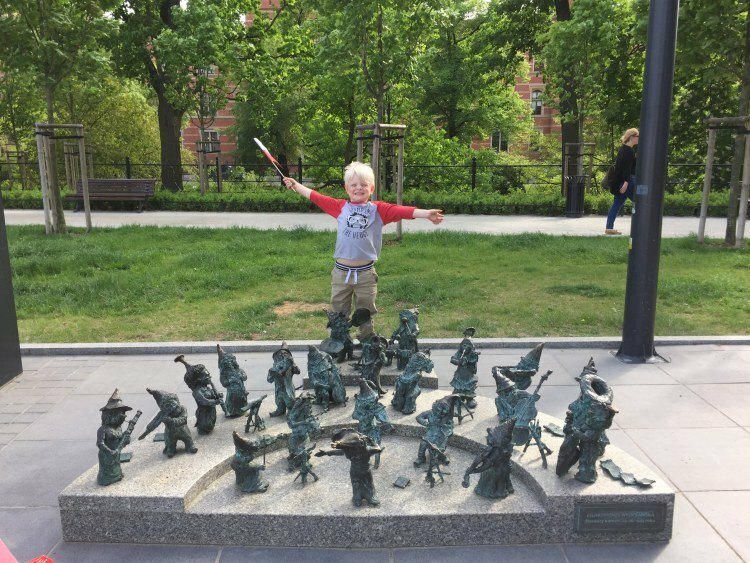 Finding the Wroclaw Gnomes is not hard to do. They are everywhere. You will find many maps online. We popped into the TI to purchase the official map. The map has locations and pictures of 100 of the more than 400 scattered around the city. No one is ever quite sure how many there are since they are always coming and going! In reality the map is not very helpful. We liked having the map though, as it gave the kids something to check off and helped direct our visit. It is a great way to practice map reading skills. We still didn’t find all of the listed Gnomes, but the Littles were up each morning begging to take new paths through the city just to see if one might live on the new path. There is also an app that you can download for free but we found it confusing so it didn’t work for us. Tangible is sometimes better! The official webpage can also be very helpful. Here you can look up the gnomes, print a map or even find some suggested walking routes. You could easily spend an afternoon looking at these cute guys online and reading about each one. We however, threw all caution to the wind and just walked around the city looking for them. We certainly found our fair share this way. The littles loved posing with the different Gnomes they found. They made up stories about what they were doing and tried to imitate many of them. We Googled them to find out their backstory or asked locals about them. There are many different artists of the Wroclaw Gnomes so they come in all different styles. Papa is the largest and the most different in terms of style. He is also the original. While the gnomes are fun to find now they started as a political resistance to communism. Papa appeared on this busy street on June 1, 2001 to commemorate that political activism. He is now retired from political life and instead is the father of all the gnomes who have settled in Wroclaw. This little guy held the key to the Gnome city. All the secret underground Gnome paths can be unlocked with this key. Unfortunately, it can only be used by the owner and he was unwilling to take us along. We stopped to enjoy some music from this busker and onlooker gnome. These two were hard at work moving this stone into the right place on the sidewalk. This one was hard at work at the Starbucks. He obviously does a good job as people leave coins on his desk. These two Gnomes sit outside the bank and are experts in all things money. One holds a bell getting ready for the opening and closing of the markets while the other counts coins. This little guy went looking for work abroad and ended up going to The Netherlands, so of course we had to find him! Legend has it that rubbing the resume will bring you financial success in the short term, but touching it on your 18th birthday will bring you luck in money and your career for the rest of your life! We presumed he made some Kabouter friends while visiting Holland. This gnome works for the local news station and was looking for someone to interview. This gnome is a world traveler. He has taken up residency in one of the local hotels after spending much of his life traveling all of Poland and most of the world. The boys discussed their various journeys with him and he quickly became a family favorite. This guy stands outside a local bio-cosmetics store offering the wares to those who pass by. This Gnome is a miner, the boys figured he therefore must know the 7 dwarfs. We serenaded him with a round of “hi ho hi ho.” He was unimpressed. Hold up! That is not a Gnome. Are cats and Gnomes friends? We think not because there was not a Dwarf to be found around this cat. I was glad to see that the Little Little took much joy harassing this photographer Gnome. It is always nice to know that it is not just me. The Middle Little found this one straight away as ice cream is one of his favorite things. He loved that the Gnome has a cone to share. As a friend and lover of animals, the Little Little instantly took to this lion-riding Gnome. He is sponsored by the Lions Club. Amazingly we left this guy alone as he enjoyed his beats. This little Gnome was hard at work fixing up walls around town. We may have gotten in his way just a little bit. Sorry little friend! Some of the Gomes have water duties. They seem to hang around the water pumps. If you manage to get a bit of water from their buckets it is said to erase wrinkles, but they are quite stingy with sharing. These three Gnomes represent the disabled. They sit near one of our favorite Poland features which are the models of all the churches designed for the blind to be able to feel the architecture. Here Jeff is holding his hand’s over our Big Little’s eyes so he could feel the church. Quite a few of the Gnomes can only be found by looking up. There are a whole set that hang out on the light poles. The last one is the lamp lighter. He serves on Church Island, where the gas lamps are still lit each night. This tourist Gnome has traveled the world and Wroclaw. Now he happily resides outside the Tourist Information office to answer any questions you might have. This was the Big Little’s favorite. Appropriately, he is the Gnome that is always finding fun things to do. He is full of joy and never bored. They even have their own little bank. This guy was using the ATM when we stopped by. We joined this guy for a bit of down time. We watched some TV and kicked back. This one celebrates the Guiness World Record for most people playing Hey Jude together on the Guitar. They get together every May 1 and try to break it again. We happened to be there for the 2018 record breaking gathering. This is the Friendship Gnome. He is one of the happiest of the bunch and even has his own Facebook page! We embraced our American roots and stood with this Lady Liberty Gnome. We have quite a bit of Polish blood running through our veins. Although it is said that these Gnomes have retired from political pursuits they stand as a reminder of what they fought for. Freedom is written on her book in Polish, English and French. We helped this tourist Gnome find what he was looking for. These two Gnomes live in the sweets shop. They pull themselves up and down on the rope each day to help bake and distribute treats. This sleepyhead had one job to do – guard the gates to the Gnome’s underground passages. Unfortunately he has fallen asleep on the job. These firefighters are always on duty. They have made their home near Garrison Church as it has suffered from three massive fires in the city’s history. This Gnome has come from Italy to live in Wroclaw. With him he brought all his favorite Italian things. This little guy sleeps outside of one of the hotels. We happened upon him on our way home one evening and the kids were delighted to see that the Gnomes had already headed off to bed. We had to track down the little professor just for Jeff. This Gnome was busy reading and hardly even glanced up at us. Vandals continue to steal this little guy, but he had been replaced by our visit and we hope he is there when you stop by too. This friendly chap invited us to stay for a cuppa. There was hardly room at his table so we left him to enjoy some people watching with his tea. With all these Gnomes about they have formed their own symphony. We stopped by for just a bit to listen to them play. We are huge fans of baked goods so of course we had to pop into this store to try one of the croissants this Gnome was holding. These two are hard at work fixing one of the two Gnome ATMs in town. This guy commemorates World Jazz Day and was placed here in 2016. The motorcycle Gnome was the first of his kind to get a drivers license. He is always whipping by and can’t stop to give anyone a ride! This is the blacksmith. He is nearly deaf due to pounding his mallet upon metal for hundreds of years. He makes the most beautiful jewelry, but is grumpy and doesn’t like to take orders. Another busker, this Gnome uses a ledge as his stage. This Wroclaw Gnome has found a ride on a friendly pigeon. The Littles are huge fans of the podcast Wow in the World, where Mindy rides a bird. They assumed these two must know each other. No one can remember how this guy landed himself behind bars, but here he sits for all eternity. These two make sure that everyone has a drink. They pour out a bit for everyone to enjoy. This little guy is the heart of the city. He represents the openness of the Wroclaw people to live in harmony with the Gnomes. People rub the heart in the Gnome’s hand in hopes of being more open and loving themselves. There was even one last Gnome at the train station to bid us farewell. A perfect end to our Gnome hunt in Wroclaw.